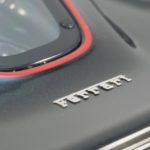 The Ferrari The Ferrari – sounds a bit pretentious doesn’t it? 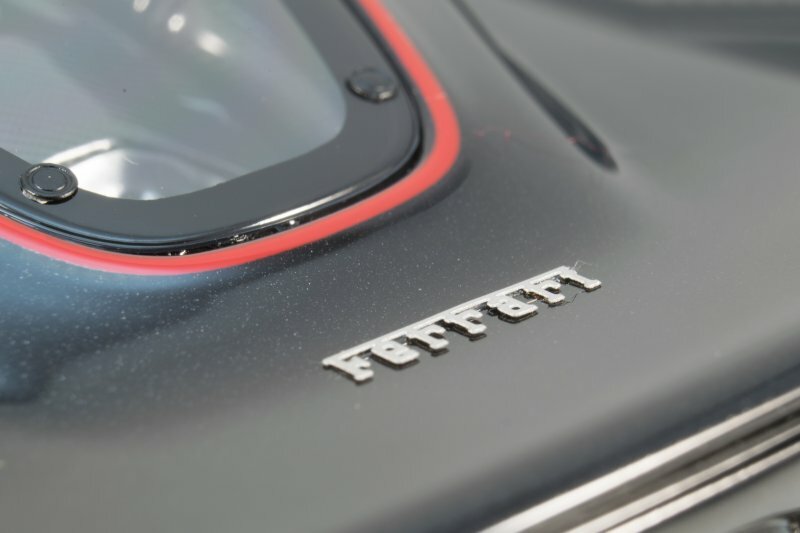 But then again, this is Ferrari we’re talking about here and with a track record and a history as illustrious as there’s I think they are suitably qualified to make such a bold statement. 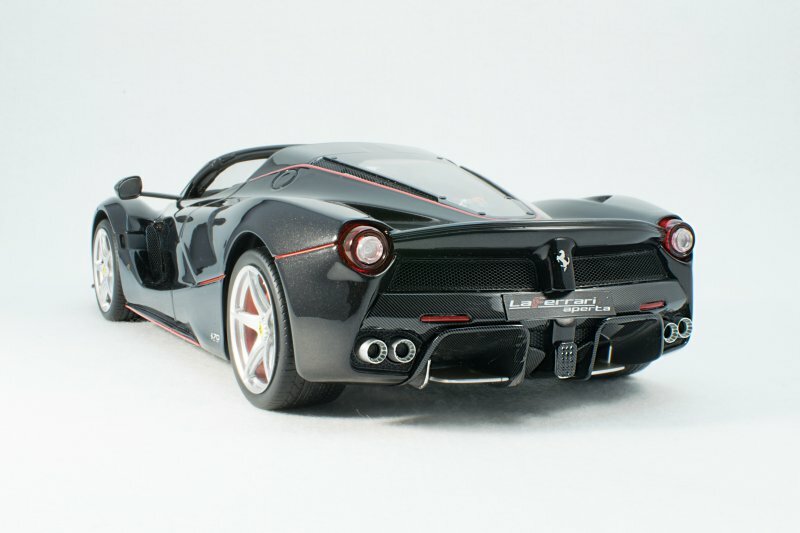 The LaFerrari is named as such, in order to convey that this is the definitive Ferrari. 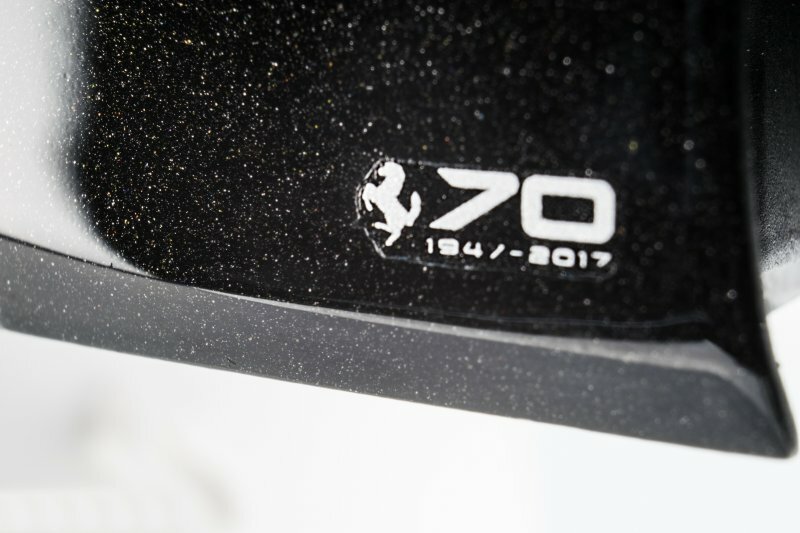 The very essence of Maranello and Fiorano distilled into something that sits on four wheels. 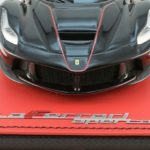 (As an aside, I wonder if they’ll call its replacement the LAFerrari/THE Ferrari, because I’m sure that will be the definitive Ferrari?) 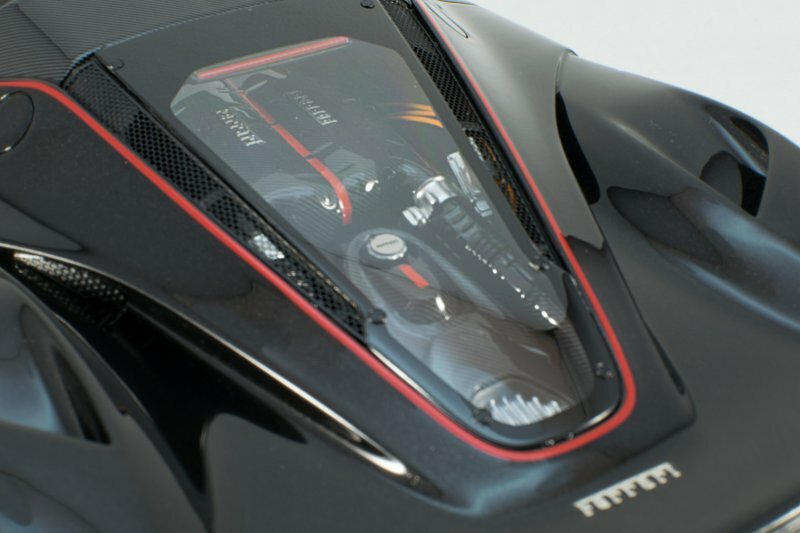 Project name F150, the LaFerrari was unveiled at the Geneva Motor Show in 2013. 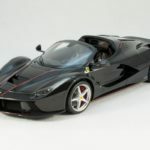 With only 499 units built plus an extra one that was sold at auction for a cool $7 million in December 2016 in order to raise money to help rebuild parts of Italy that were affected by a series of earthquakes in August that year. 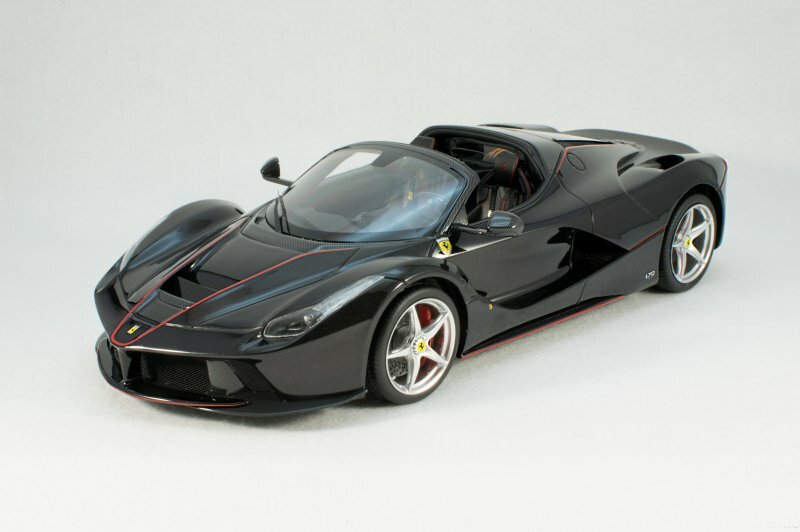 This instantly became the most valuable 21st Century automobile to be ever sold at auction! 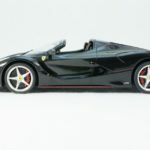 The LaFerrari Aperta was unveiled at the 2016 Paris Motor Show, this time being an even more limited edition special with only 200 units earmarked for production and a further 9 reserved for select distribution during Ferrari’s 70th Anniversary celebrations. 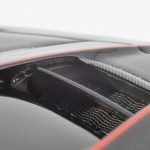 It comes with a removable carbon fibre roof panel and also a soft top as well. 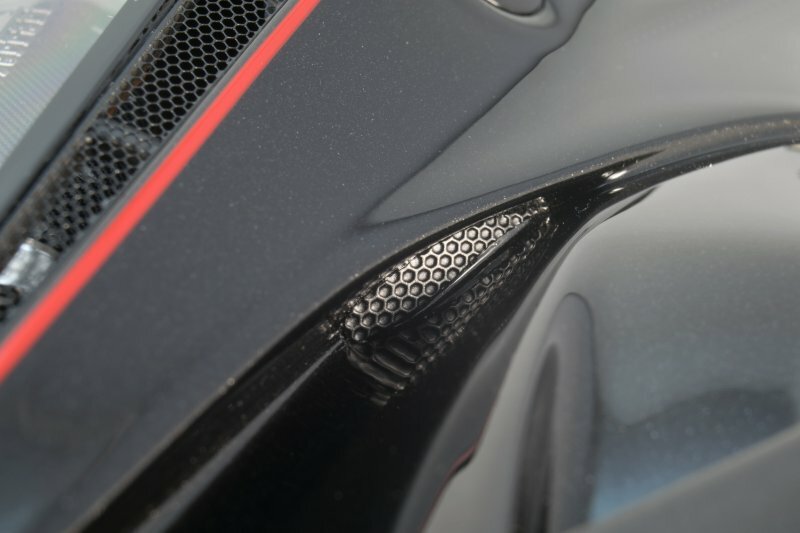 Other changes over the coupe include re-angled radiators to direct air flow out along the underbody rather than over the bonnet and thanks to a series of targeted modifications designed to reinforce the lower area to cope with the new stresses of no fixed roof, allow the LaFerrari Aperta to deliver the same torsional rigidity figure as the coupe which is rather mind boggling if you think about that for a second. 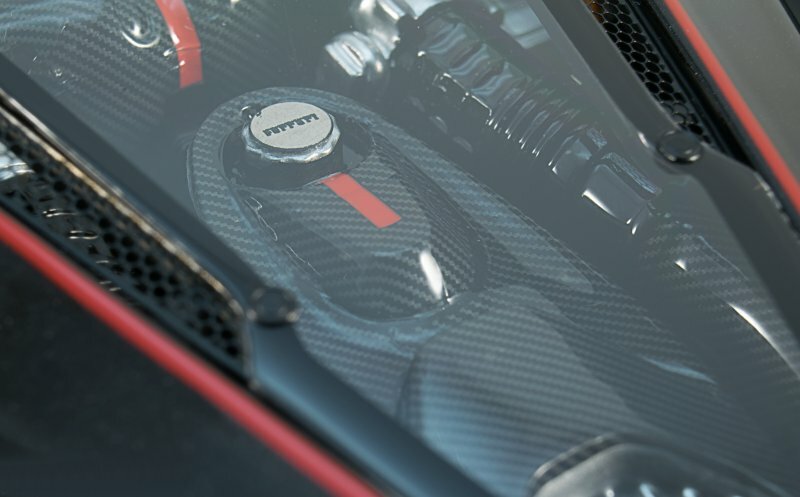 Speaking of seconds, the HY-KERS hybrid 6.3 litre V12 powertrain rockets this low slung bullet from 0-60mph in “under 3 seconds” and onto a top speed of “over 217mph”. 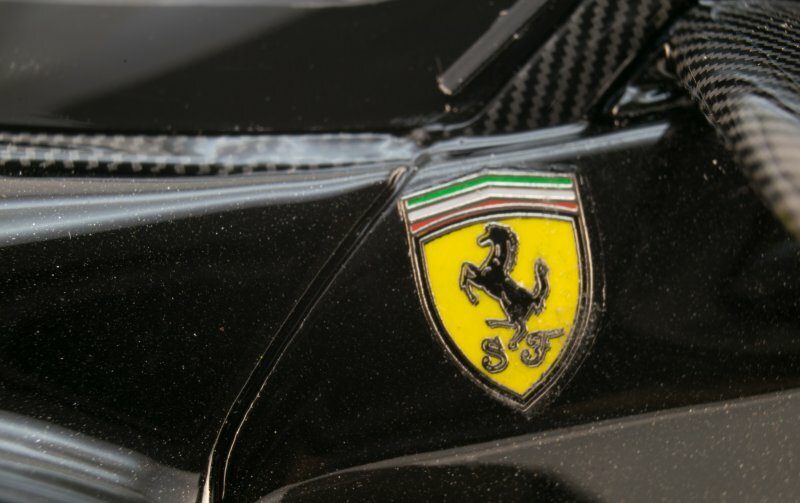 The V12 is the most powerful naturally aspirated engine to ever feature in a Ferrari road car and couples that beast of a V12 with a 120kW electric motor to generate over 900Nm of torque and 950BHP. 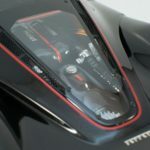 All this power is put down by a 7 speed F1 dual clutch gearbox to the rear wheels and serves to solidify its place in the Holy Trinity of hybrid hypercars alongside the Porsche 918 Spyder and McLaren P1 – both superb machines in their own right. 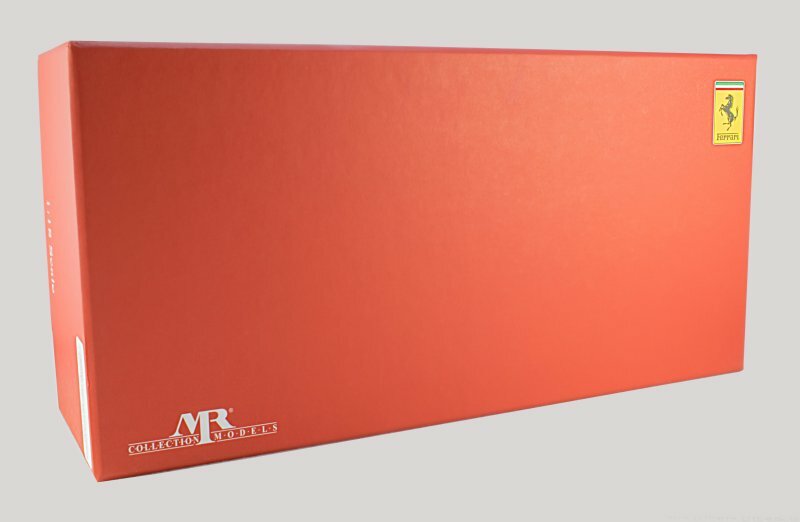 MR Collection Models is a small Italian based model manufacturer situated in a small town near Lake Como and Milan. 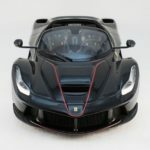 They only employ around 15 people to produce their models in 1:43 and 1:18 scales (although they have partnered with Amalgam to produce the likes of the 1:12 Ferrari LaFerrari 2013 Geneva Motor Show car and the Bugatti Chiron will be the first in a line of huge 1:8 scale models come the summer). 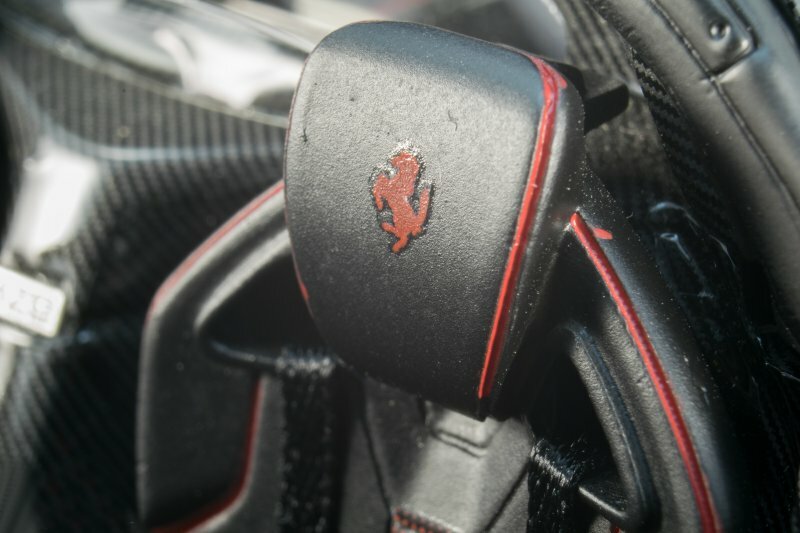 They hold official licenses for Ferrari, Lamborghini, Alfa Romeo, Audi, Volkswagen, Bentley, Bugatti and Porsche. 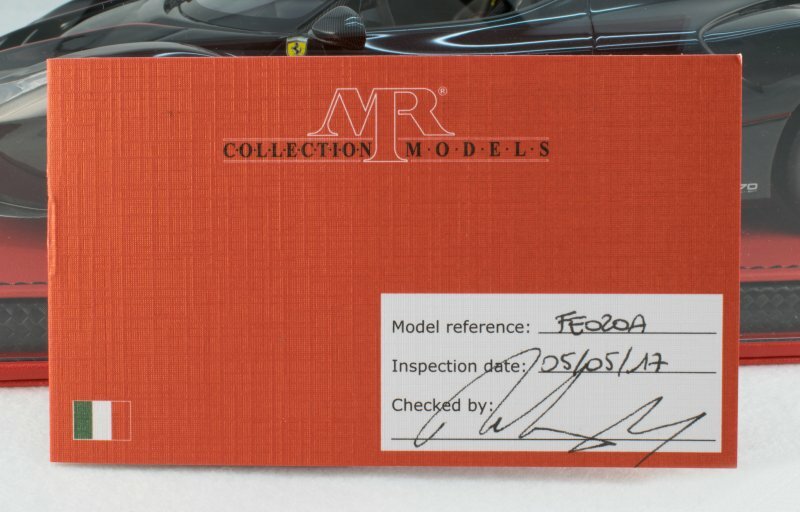 MR Collection are the official supplier of Ferrari models, so when you see a 1:43 or 1:18 scale model car at an international motor show or world premiere stand, that’ll be one of MR Collection’s models. 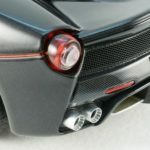 They also make models for the Ferrari Contact Plan – the exclusive service that creates models in 1:43 scale with the same colours and features of the cars bought by Ferrari customers from the factory in Maranello! 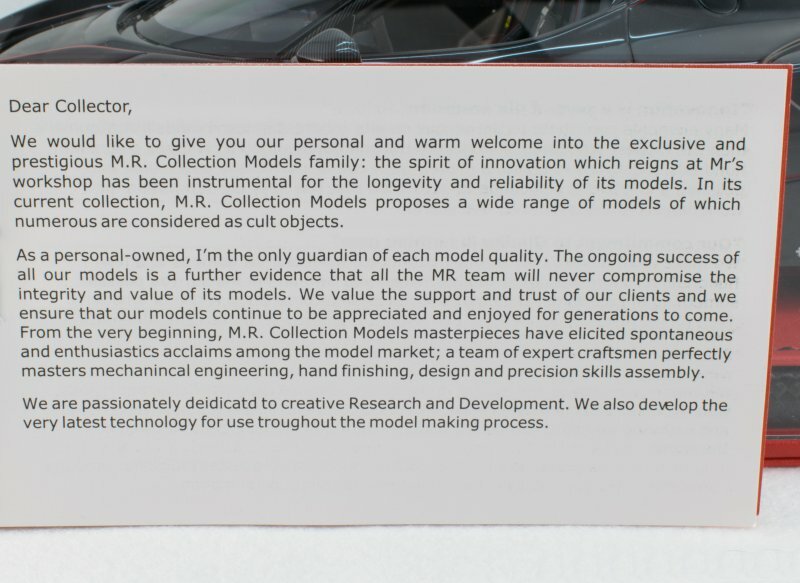 People often mistake MR Collection and BBR as the same company, but in fact BBR aren’t even Official Suppliers and haven’t been for at least 10 years. 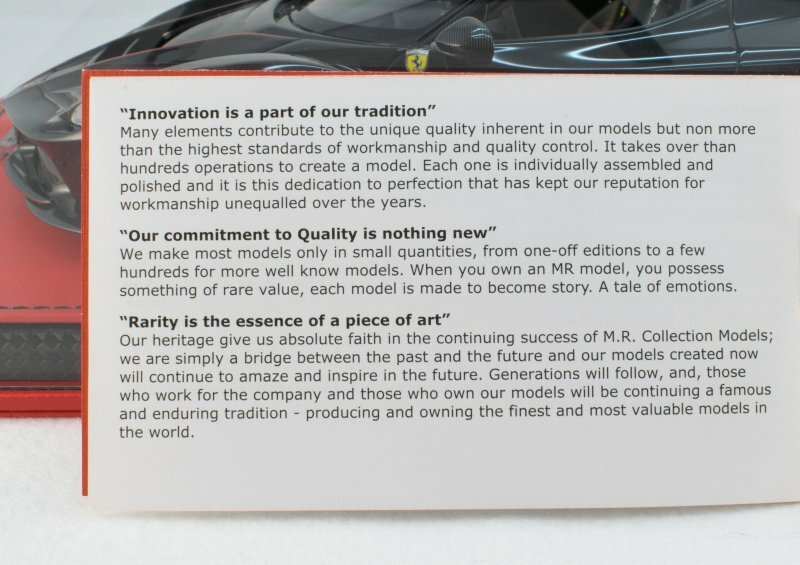 Oh, let’s not forget MR Collection’s sister company called Looksmart Models that also makes Ferrari models. That sounds like quite a list of improvements and this review will look to see if they’ve delivered on these points and look at various other aspects of the model. Let’s start with the packaging. 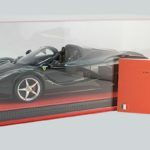 The LaFerrari Aperta comes in this really eye-catching red cardboard box with the Ferrari and MR Collection logos nice and bold in opposite corners. I think it looks quite nice and modern and prefer the fact it’s not too busy with loads of information on. 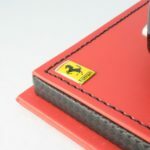 You can imagine this stacked proudly on the shelves of a Ferrari Store for sure! The only thing that does disappoint me is that this appears to be pretty much the same box as Looksmart Models use for their scale models. 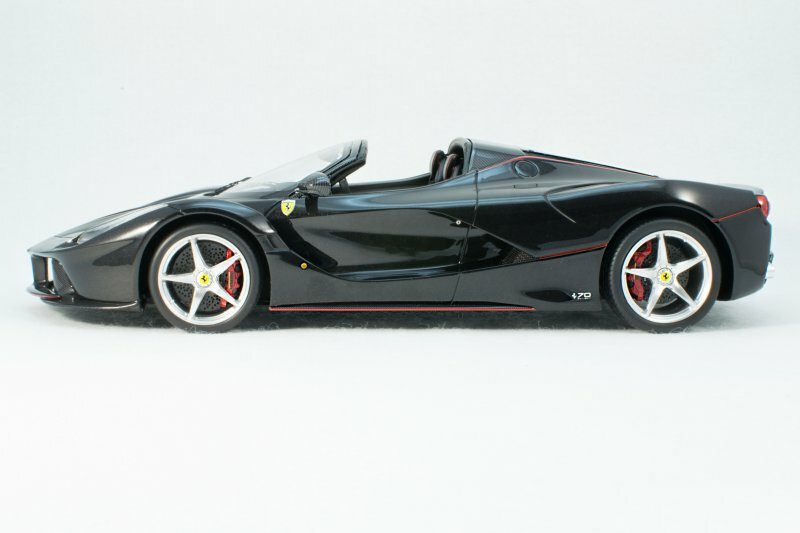 After seeing some collector pictures of their recent 1:18 Ferrari F60 America release, I was a bit annoyed, because if you’re spending around double the price on an MR Collection model versus a Looksmart model you’d certainly expect a nicer box. 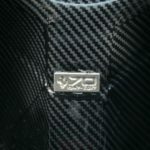 I think Frontiart’s Avanstyle have the idea of a plush box nailed down, as you can see from my review of their Nissan GT-R R35 Nismo. People may think I’m weird for pointing this out, but for me, as a collector the packaging is indeed part of the whole package! 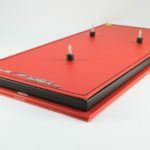 Upon slipping off the top cover of the box you are greeted with the model stored safely inside the protective bubble that is a nice looking display case. Taking the whole thing out of the lower part of the box and setting the heavy piece down on the table you get to see the model in its entirety for the first time. First impressions are certainly a wow for me! 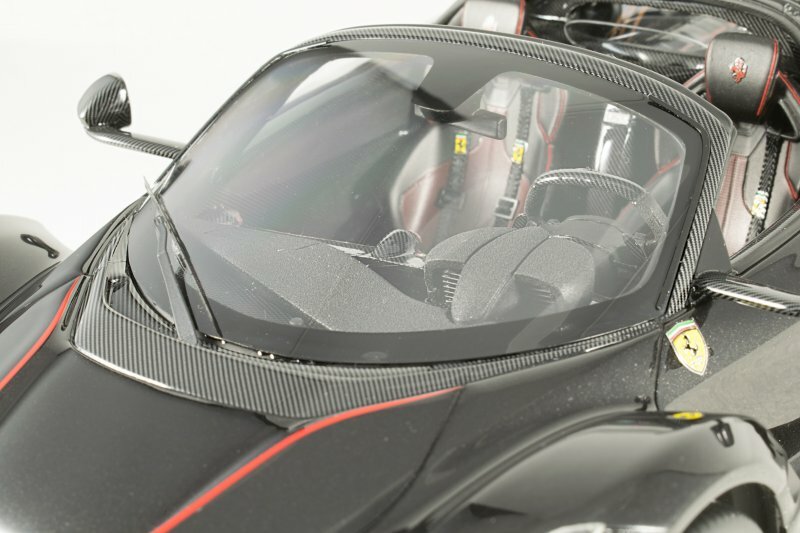 For anyone who knows me and my collection theme, hypercars feature very heavily and it is an absolute pleasure to have this in my collection. 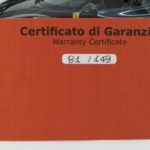 The model also comes with a little red booklet, with the model number, inspection date and who checked it before it was shipped out. 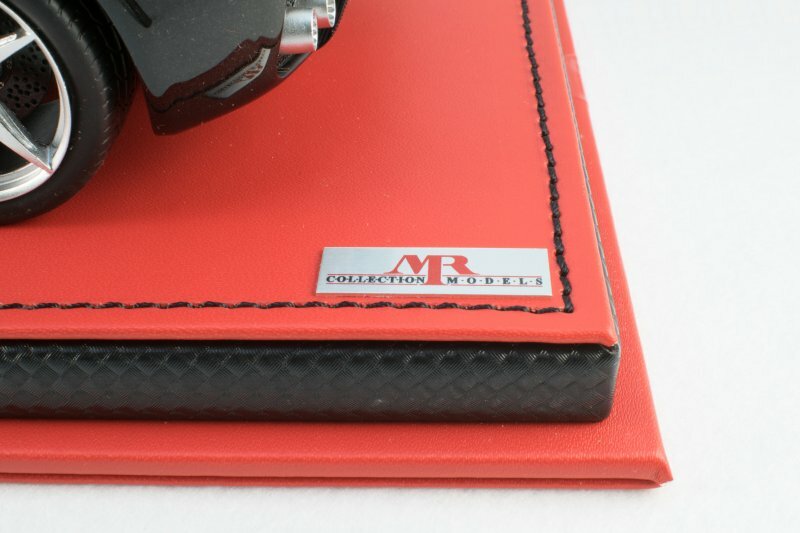 On the inside cover you will see where your model came in the order of production, with this particular model being limited to just 149 pieces – it is nice to know when you spend decent money on a model that it is nice and exclusive! The rest of the booklet details a somewhat personal message in slightly broken English about how you, as a collector, are essentially a custodian of a rare piece of art. The fact that this is only 1 of 149 goes some way to prove that point. It’s a nice little extra touch, I must admit. Take the cover off the base and you are hit square in the nose with the strong smell of paint and glue. My model was inspected on the 5th of May and it was shipped later that day, so the model was literally hot (and a bit smelly) off the production line! 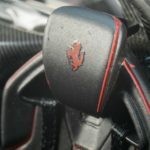 I’m the kind of guy who likes the smell of unleaded petrol, so it really didn’t bother me at all and it actually added to the sense of occasion – much like the smell of a brand new car as you get into it for the first time. 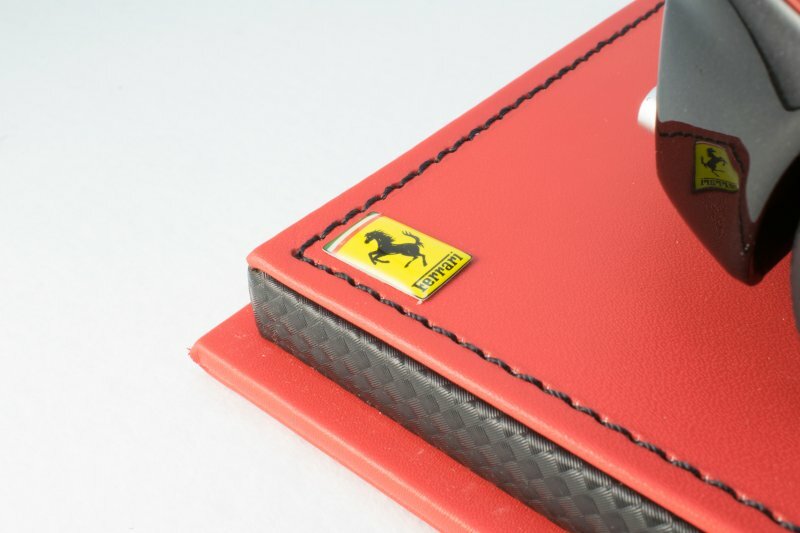 The base has three sections to it: a lower layer of red faux leather, a middle layer of a nice woven carbon fibre effect and topped with a layer of faux red leather complete with black contrast stitching and a really nice replica of the LaFerrari Aperta badge that is present on the passenger side of the dashboard. 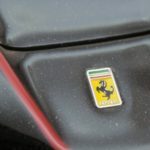 There are also a smattering of MR Collection and Ferrari badges. As far as bases go, it is pretty nice! 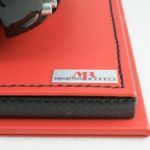 I have seen from BBR’s version of this model that they have the base available in Alcantara as well. Now, as will become clear later on, these models aren’t really supposed to be removed from their bases. They are primarily display pieces meant to be kept the way they are. I have removed mine from the base by piercing 3 holes from underneath and unscrewing the screws – they are quite stiff so a drill or an electric screwdriver is probably needed, unless you’re The Hulk (and if you were The Hulk you’ll probably end up crushing the model before you even get to this stage). 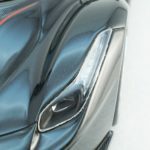 Now that the model is off its base, let’s begin to take a closer look. I think this 2016 Paris Motor Show version in the Nero Daytona (black to you and me) looks absolutely spectacular with the contrast Rosso Corsa (yup, you guessed it…its red!) lines all around the car. I think the red lines serve to accentuate the curves and overall shape of the car really really well. And as I mentioned above, I think it is also quite refreshing to see a Ferrari that isn’t red. 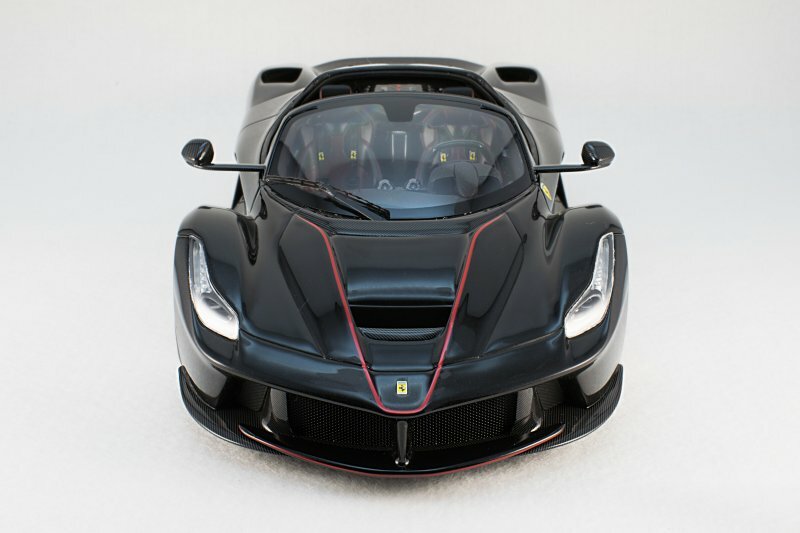 I used to have all three colours of the Hot Wheels Elite LaFerrari coupe in red, yellow and black and side by side, I’ve got to say the black was by far the nicest looking. I’ll let the pictures below speak for themselves, but I just want to say that I think the Aperta carries off the roofless look very well indeed. 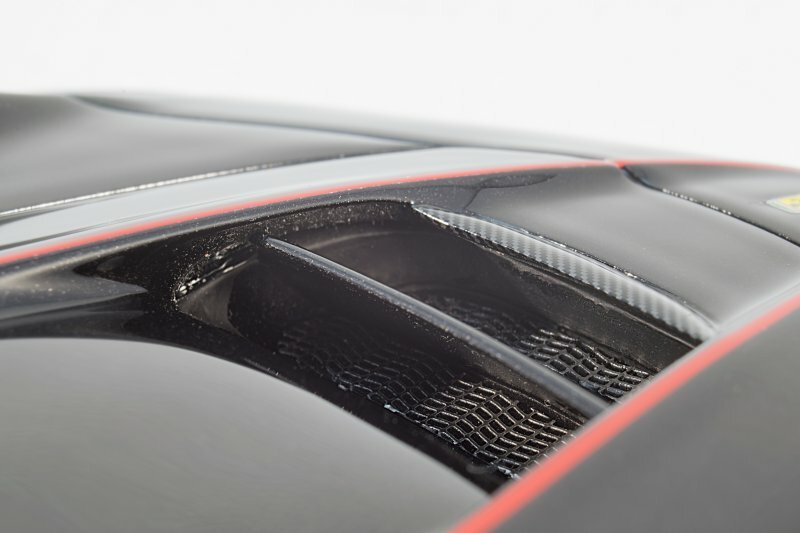 To differentiate from their competitors, maybe MR Collection could have added the carbon roof panel in the box? That would have been a lovely novelty! Flipping the model onto its side (be careful when doing this as the wing mirrors are delicate on their long thin arms), you’ll see why I mentioned this is chiefly a display piece intended to be left on the base. 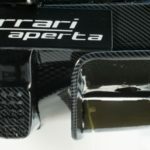 While they did well to make sure the whole rear diffuser was finished in carbon and the aero flaps fully painted, the rest lacks detail. 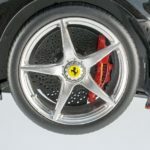 You’ll also notice the lack of finish on the inside of the wheels with the red brake calipers just stuck onto the discs. 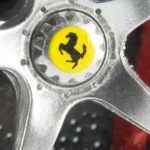 If you try and turn the wheels, nothing will happen and that’s fine as it means the centre locking Ferrari wheel caps are always dead straight – which is exactly what you want on a display piece. 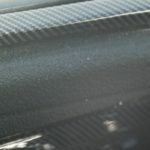 What is hard to see from the photos, but is definitely present, is the very slight flat spots on the bottom of the tyres where they’re touching the base and you may just be able to make them out on the picture of the base without the model on above. 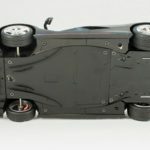 Again, that doesn’t bother me as long as the model is not screwed down so tight that it causes the wheels to shatter – I had that on an Engup Ford GT I once bought. Luckily the spacers seem to be doing their job perfectly. 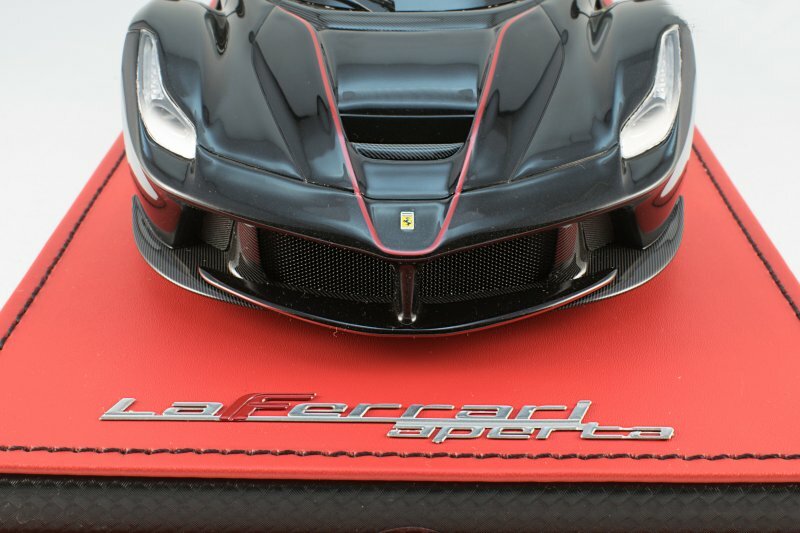 Onto my favourite section of my reviews and time to look at the finer details of the LaFerrari Aperta up close. Starting with the badges around the model and they are a mixture of photo-etched pieces and metal-like waterslide decals. 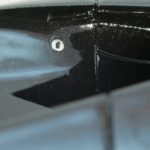 You may see a bit of excess glue around some of the edges on these macro shots, but in person you won’t really notice them. 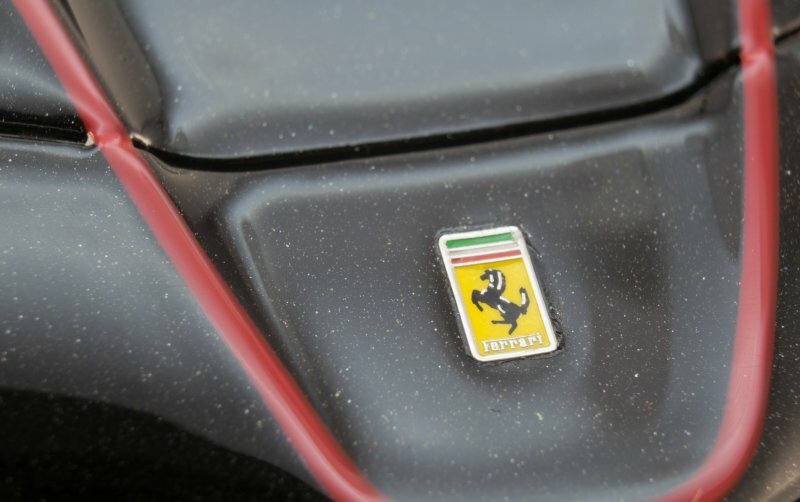 I just love the colours of the Italian flag included in the front and side badges. 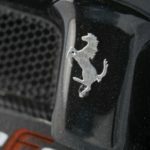 This was one of the improvements MR Collection specifically pointed out – a 3D logo of the Prancing Horse on each flank. I’d give a resounding yes and say they have certainly delivered on this point. The badge has a really nice depth to it and the detailing on the horse itself is pretty top notch. Well done to the team! 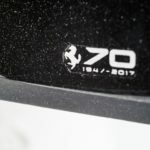 The 70th Anniversary badges on the sides near the rear wheels are a disappointment, however. It’s not that they look bad (although the 7s are not properly defined), rather it’s when you look at the real car and notice they are real shiny metal badges. 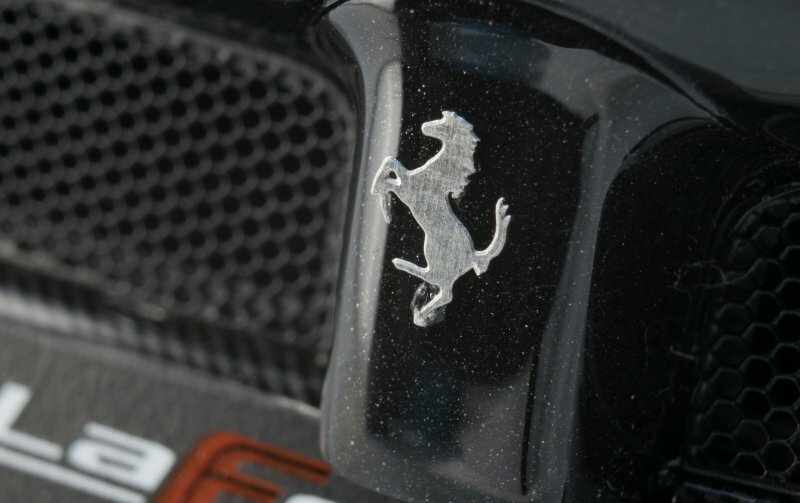 If MR Collection have gone to such an effort to create 3D Prancing Horse badges for the sides, why didn’t they continue that theme through and exert the same level of craftsmanship here? Looking at the image below gives you a great insight into the paint quality of this model. Hats off to them, the black with the metallic flakes in shows up beautifully under the light. Resin models tend to have better and smoother paint finishes I’ve found and this stunner certainly doesn’t disappoint. It is in places like this that you see where your extra money goes. Thankfully they’ve redeemed themselves to some degree by including a photo-etched key hole to unlock the car on the driver’s side door only. 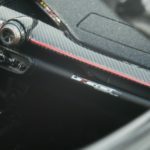 This isn’t immediately obvious to spot as it is tucked away under the curvature of the door as it flows down into the side intakes. 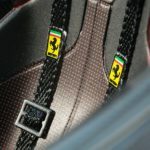 The rear Prancing Horse badge is also photo-etched and you can also see a bit of excess glue towards the bottom, but again, you won’t notice it. Take another look at the lovely metallic paint while you’re here – just beautiful! 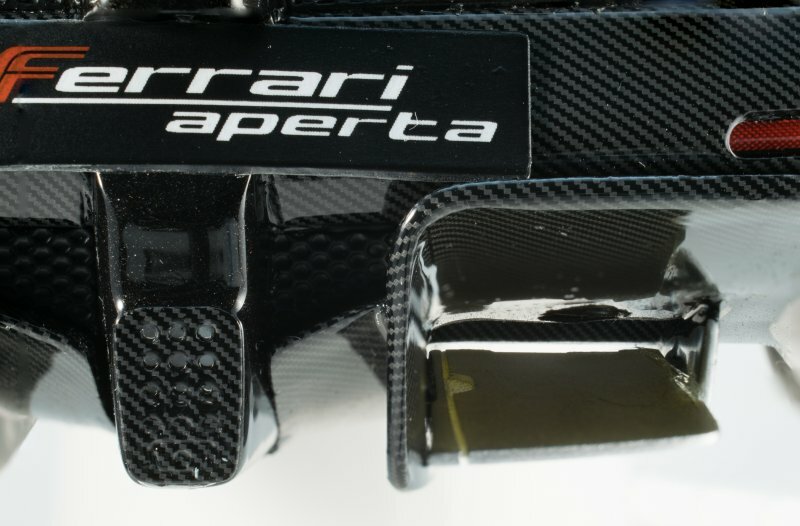 The Ferrari badge on the rear deck is also a decent effort. 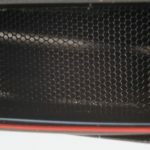 Who likes real mesh grilles on their model? Me!!! I’d give this model a solid 8.5/10 on this front. 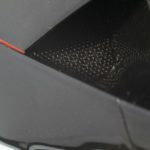 Mesh is present in all the places that really count; including the air intakes in the front splitter, exit grilles behind the front wheels, rear grilles to help cool the hybrid power plant, side air intakes, cooling vents in the bonnet area and finally the vents either side of the engine – so, yeah, plenty of grilles to feast your eyes upon. 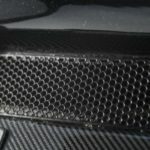 Because of the lack of finish on the underside of the model you can actually see right through the exit grilles behind the front wheels. If the model is still attached to the base and there’s a dark surface behind it, I don’t believe many collectors will notice this to be honest. 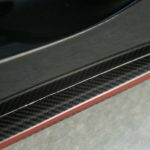 There are only 2 places where MR Collection dropped the ball and that is with the intakes atop the rear deck behind the rear wheels and the exit grilles either side of the engine that look like they smooth airflow over the rear spoiler. A big shame as it was so nearly perfect! Looking at the lights around the car and MR Collection promised “newly designed headlights with separated LED lights”. You’ll have to excuse the photo below as the lighting conditions didn’t make it that easy to capture the detail fully, but you’ll have to take my word for it that they look perfectly fine. There is a clear definition between each light node and the full beams are nicely defined too. 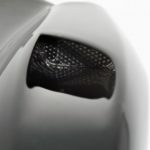 There is a bit too much excess glue around the headlight covers, however. 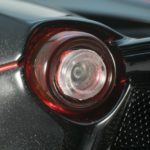 The rear light cluster looks pretty nice. I like the layered effect with the brake lights, indicators and reversing lights stacked the way they are. You can also make out the individual LEDs in the white inner cluster. 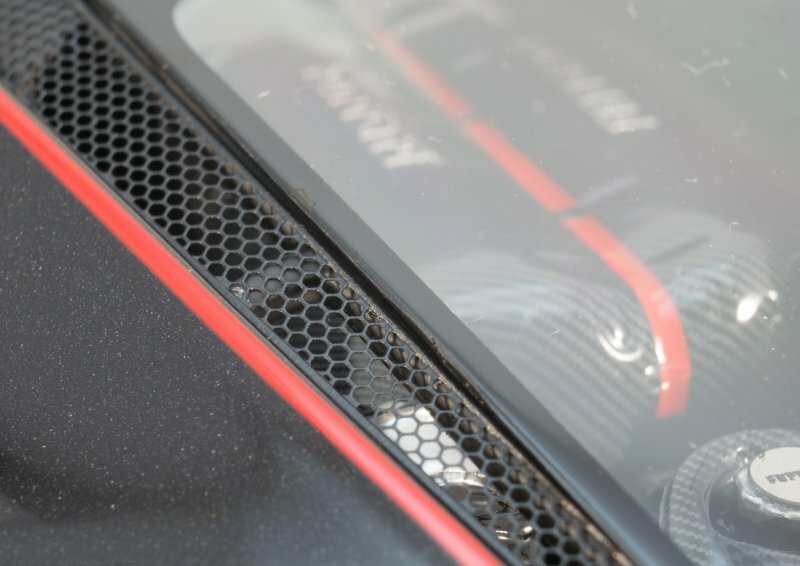 It would have been nice to see the LEDs inside the outer red cluster like on the real car and the red cluster looks slightly flatter and wider on the real car versus the model. Certainly not a deal breaker, but worth pointing out. Another worthy addition would have been a slight orange tinge to discern the indicators fully. 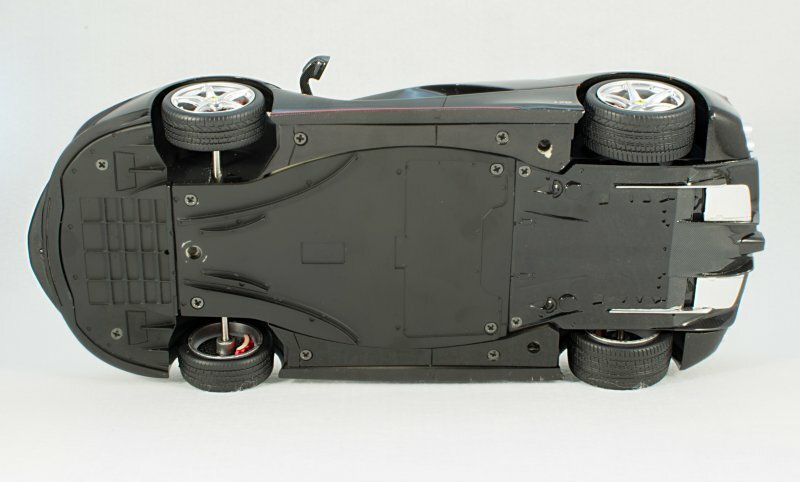 The wheels, tyres and brake components are some of the core features that can really make or break a scale model and it is no different on a low end model, or a high end model like we have under the microscope here. 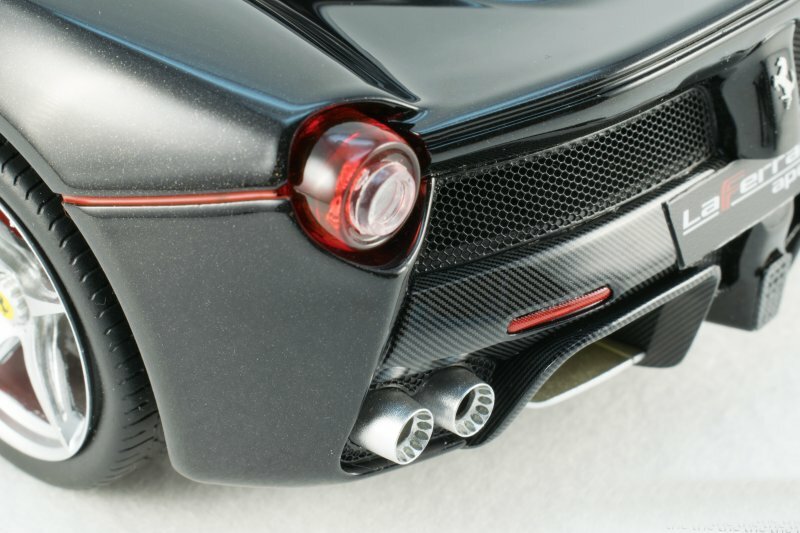 Starting with the tyres and they appear to sit in the wheelarches correctly (I’ve recently seen pictures of a 1:8 Amalgam LaFerrari and the wheel offset was absolutely shocking! 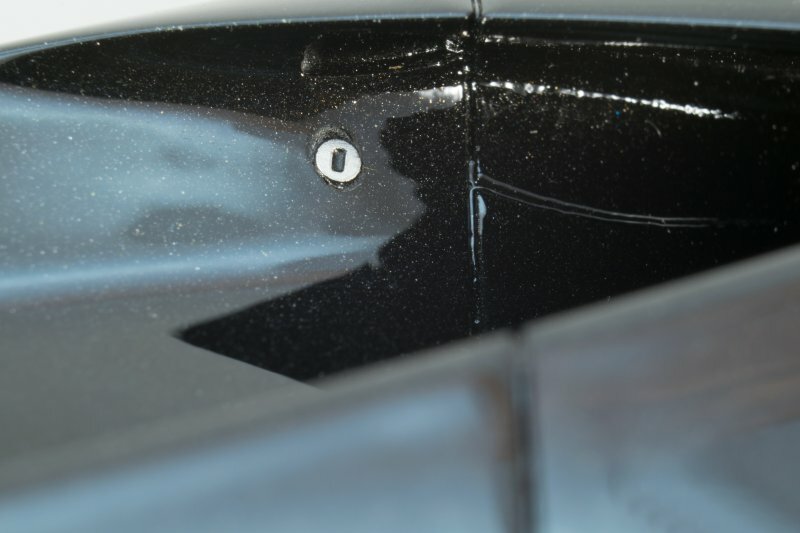 ), the tread overlaps nicely into the sidewalls as well. 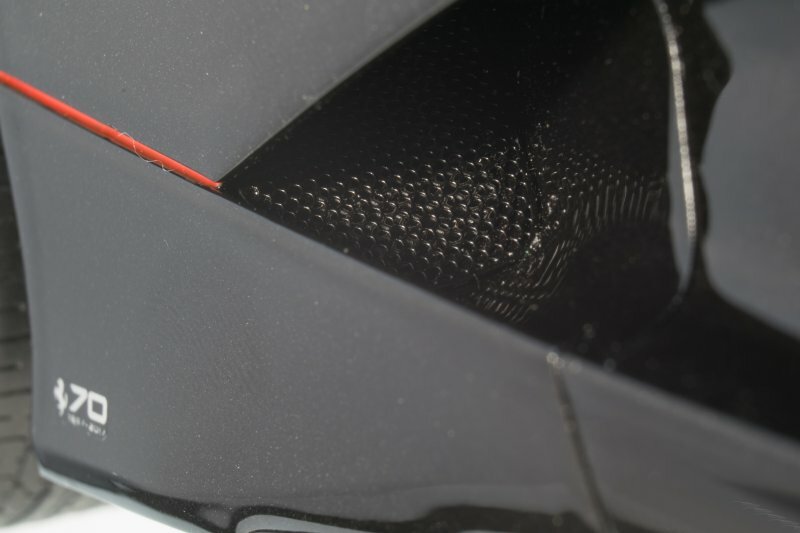 My main bugbear, which is something I think I mention in every review I write, is the fact there is no branding on the sidewalls. 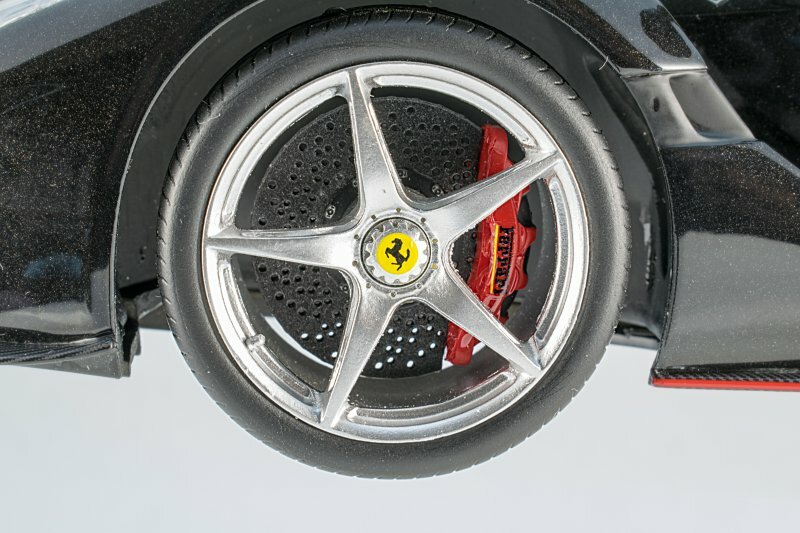 The Aperta uses Pirelli P Zero Corsa Asimmetrico tyres (19 inches at the front and 20 inches at the rear) and it pains me to see such an expensive model with this small, yet important detail omitted. 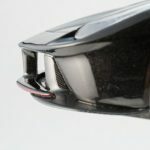 I contacted MR Collection to see if it was perhaps a licensing issue and my contact there said it wasn’t and pointed out that their 1:18 Ferrari FXX-K and Lamborghini Huracan Aftermarket models have branding painted on their sidewalls. 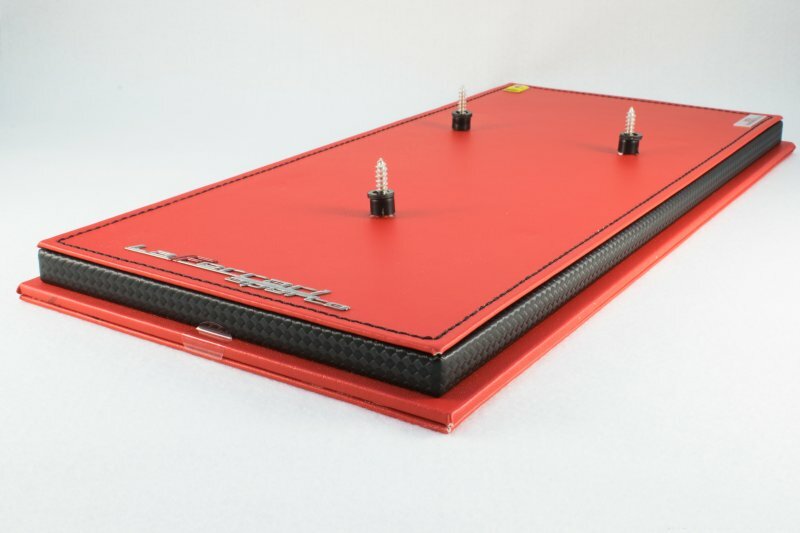 Please, please, please add this to the next round of model improvements across your entire lineup, because it really is the small things that count in a scale model replica and these certainly aren’t cheap models! Continuing with the wheel detail itself now and I think the silver finish of the 5 spoke alloys is a tad too shiny. 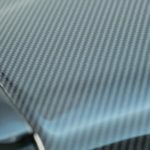 If you look at the real car they are definitely done in a more satin type finish. 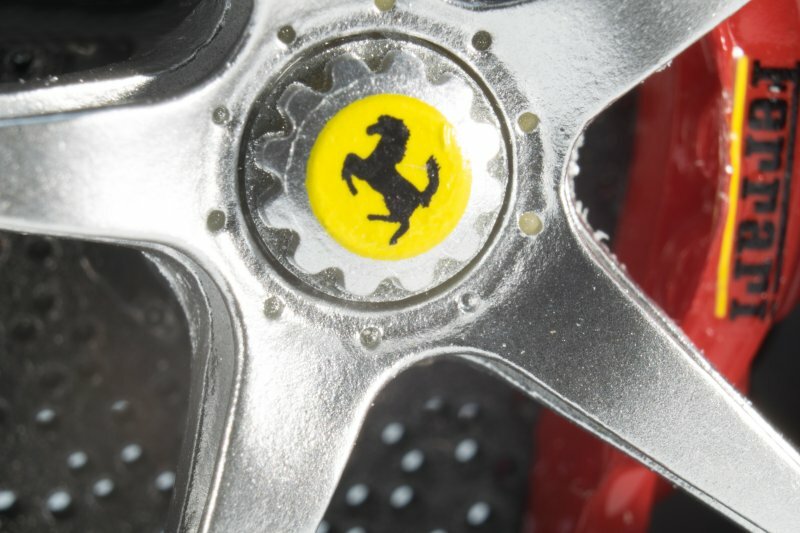 The centre locking wheel nuts, Prancing Horse badges and especially the tyre valves are spot on. The inside of the spokes definitely need a sanding down here, though! 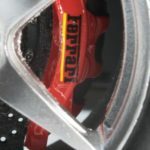 The Brembo Carbon Ceramic brakes are suitably drilled and feature the clips that hold the discs and the mounting plate together. 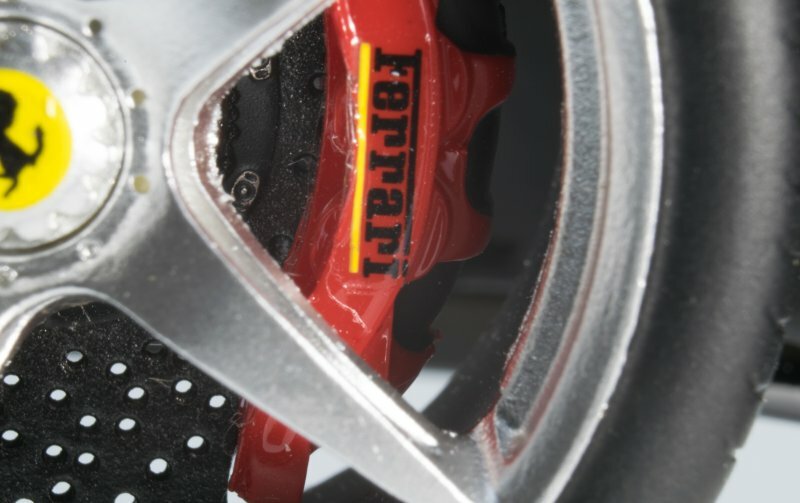 The calipers themselves are finished in that lovely shade of red and feature the Ferrari logo with pride – a great effort done by MR Collection here. 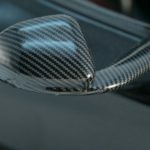 One of my next favourite topics in a model review is carbon fibre. 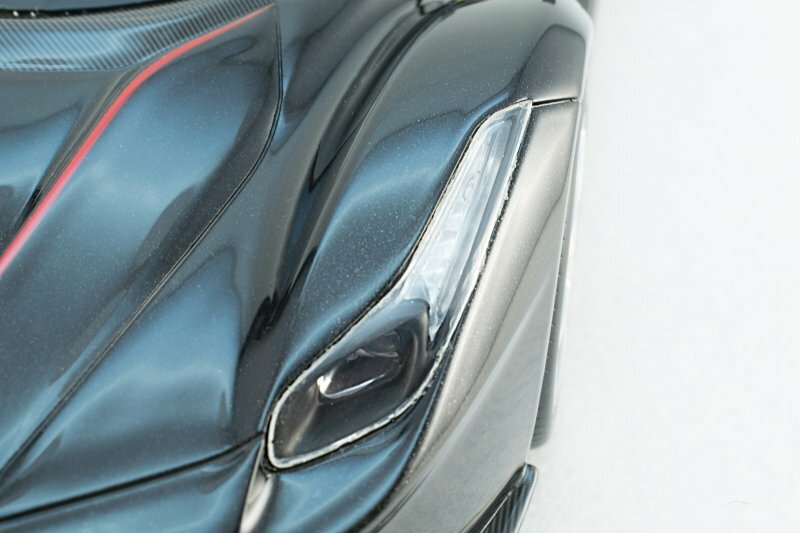 This car has it all over the place and it’s nice and glossy! 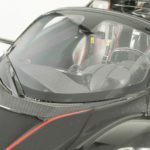 The windshield has a full border of the stuff and in the picture below you can clearly see the Alcantara effect dash top as well as the carbon wrapped steering wheel. There is also some venting present which finishes off the whole look very well indeed. 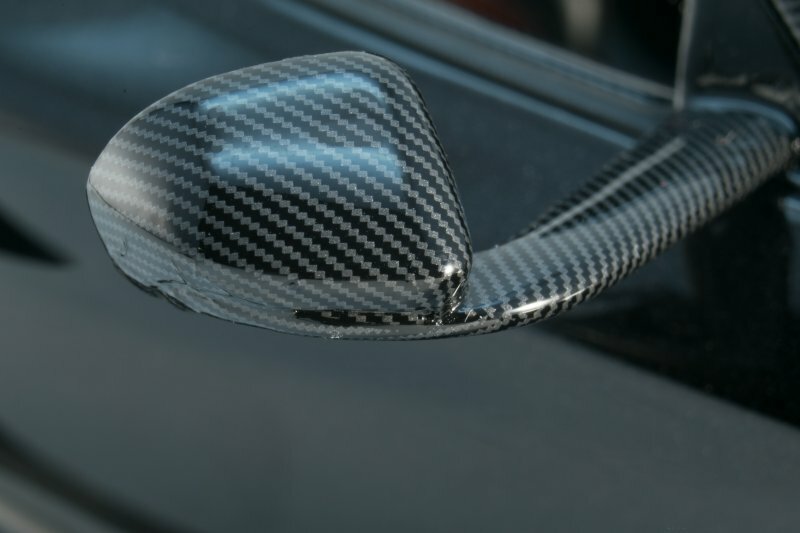 The wing mirrors and arms are also fully carbon fibre. 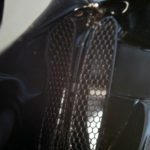 Looking up close we can see the weave doesn’t quite match up and there is some slight creasing in the lower half, but I believe the shape is complex enough to make wrapping them perfectly quite difficult. Again, I don’t think this is something you’ll notice unless you’re really close. 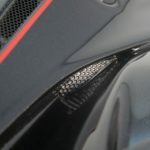 Other areas covered in carbon fibre include the side skirts with the Rosso Corsa accent line and the area above the rear bulkhead. Again, very nice and glossy and pleasing to my eye, at least. 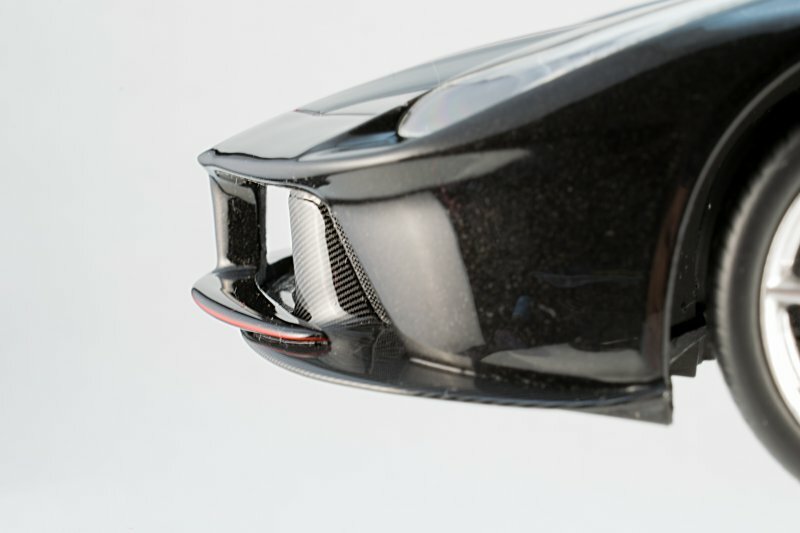 There is yet more glossy carbon in the front splitter area and also around the rear diffuser. 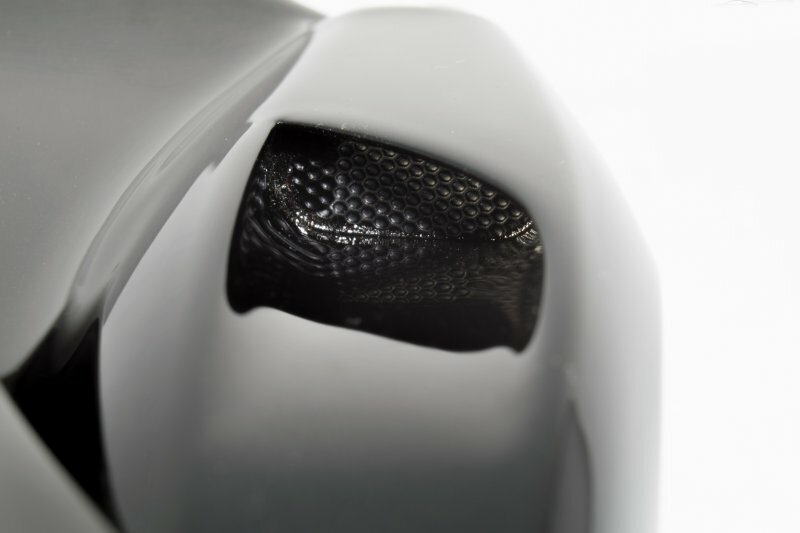 I didn’t notice this at first, but MR Collection missed out the rear parking sensors – what gives? BBR remembered it on their version. Otherwise this raised three quarter view below is one of my best angles of the car. 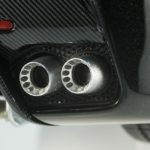 The exhaust detail is not too bad, but they are finished in the same paint as the wheels and it should be satin as well. 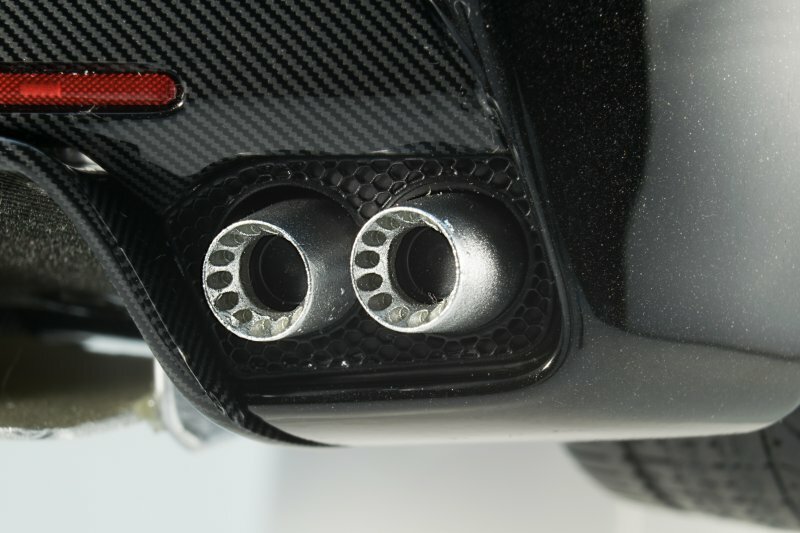 The insides of the exhausts should be a much darker grey based on pictures I’ve seen of the real car. 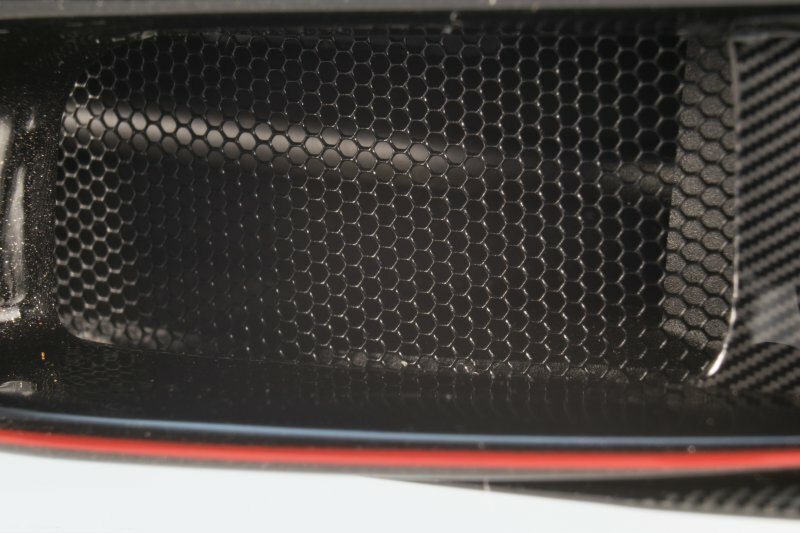 The lower diffuser is done pretty well too, with the aero flaps underneath looking good and the whole area slathered in carbon fibre. 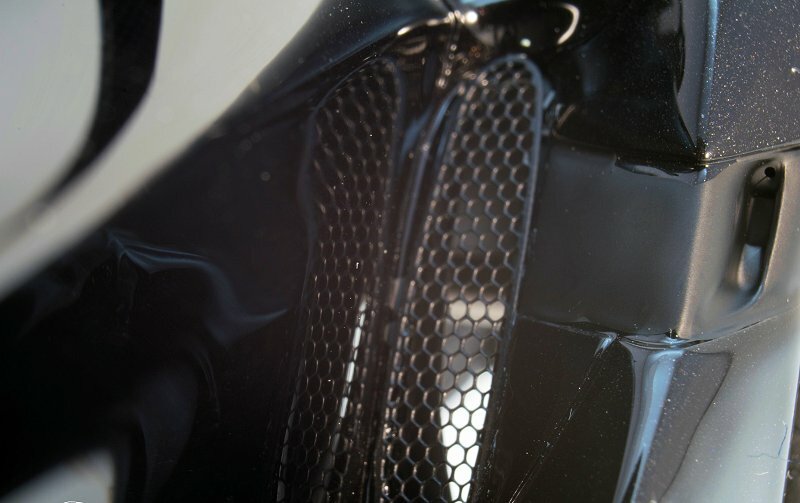 One thing that needs addressing is the fact that I don’t think the lower light cluster is supposed to be covered in carbon and also they didn’t cut out the holes for the last row of LEDs and the reversing camera beneath that. 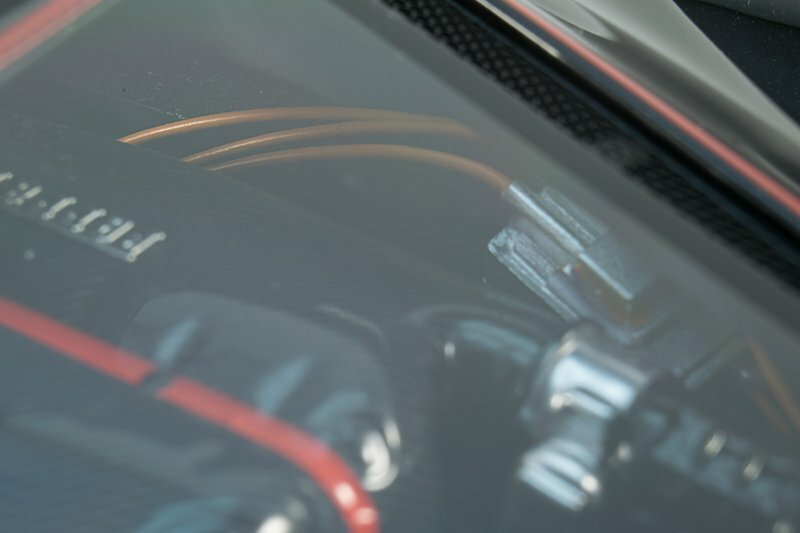 It is a shame the engine bay doesn’t open on this sealed model, but what you can see looks pretty darn nice indeed. 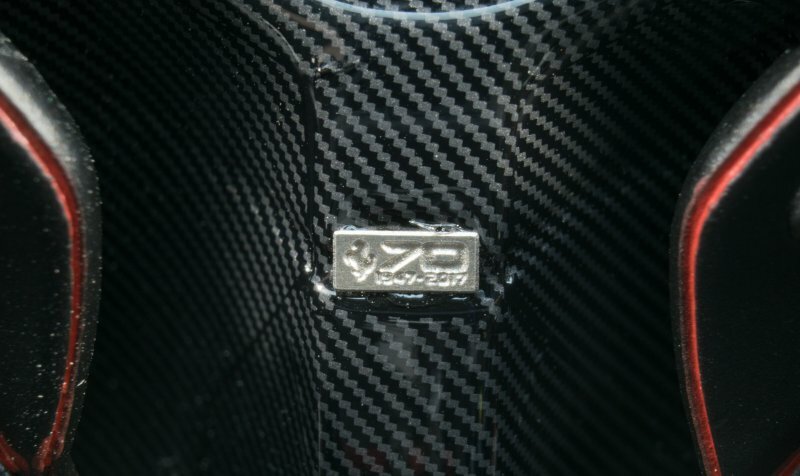 Everything in there is covered in carbon fibre and the badges and other details are well done. 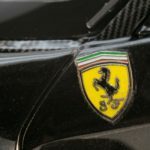 It would have been nice to see the Prancing Horse logo on the lower edge of the glass like on the real car, but we can live without it. 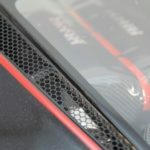 MR Collection should have really continued the high voltage orange cables that run from the hybrid system down behind the mesh grilles in the rear bumper as you’ll see is lacking in the pictures above. Sadly, another little missed opportunity on this model. 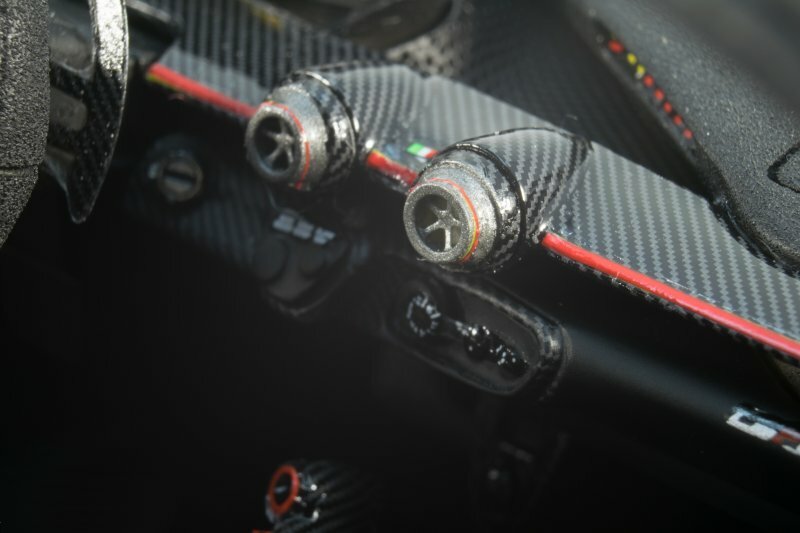 We should at least be grateful, because BBR have skipped out the orange cables altogether from their engine bay! 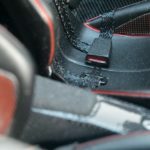 The final part of this review focuses on the interior detail and this is where MR Collection have promised the most improvements. 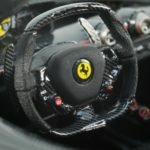 You already saw the unique Alcantara effect dashboard above and looking at the picture below you can see that continues to the two areas the driver would touch on the steering wheel. 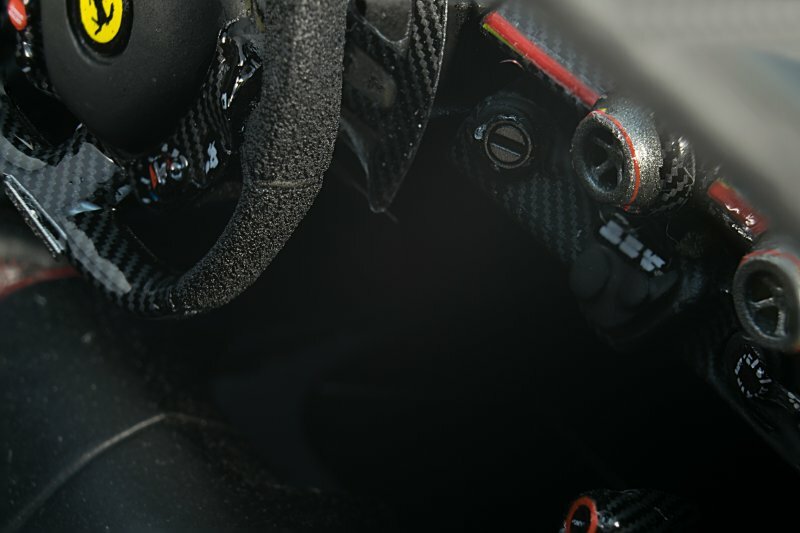 The carbon on the steering wheel and paddles is a standout feature for me as the surfaces are quite complex. The various buttons and Manettino switch are quite legible – if you look close enough you can even make out the different colours next to the switch which is worthy of note, considering most people won’t be able to get close enough to even see that. 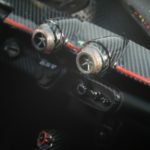 The lights that represent the engine revs are also there, although there’s no colour in there. The only thing that bothers me is the badge at the bottom of the steering wheel. 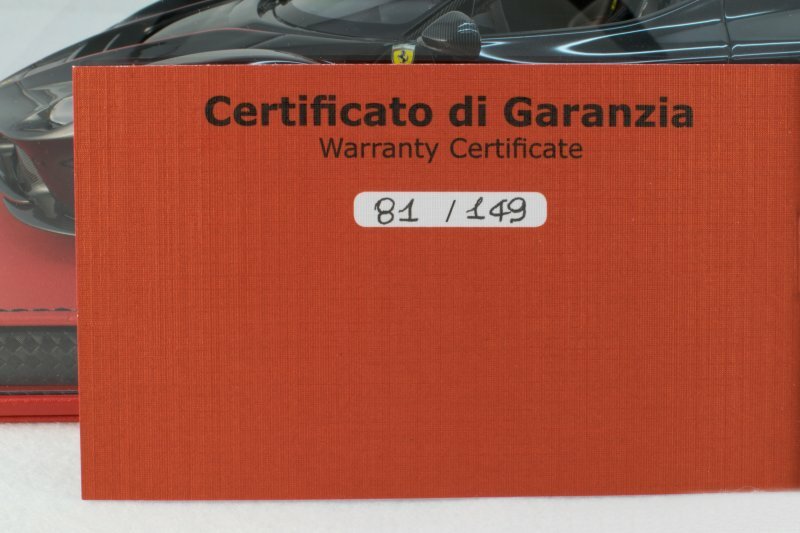 Customers of the real car can have it engraved with whatever they want, but on this 2016 Paris Motor Show car it should actually state “Limited Edition” and not “Fernando Alonso”. This is all besides the fact that someone put it on upside down! 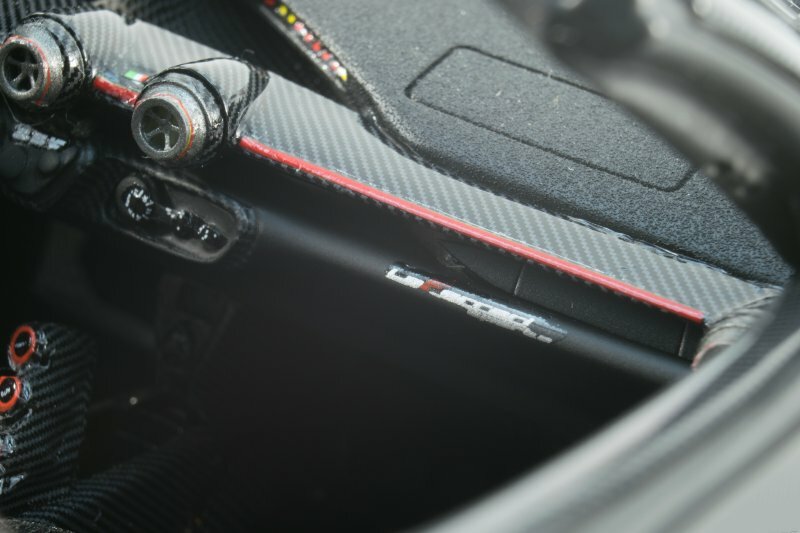 Elsewhere in the cabin, you can see little details such as the key slot, more carbon fibre and air vents with the Italian flag between them, which look pretty good. 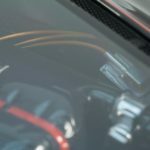 Sadly I was unable to photograph the speedometer and other dials behind the steering wheel due to the angle and the size of my lens, but you can catch a small glimpse in the picture above – however, they are perfectly legible and have a nice yellow background. 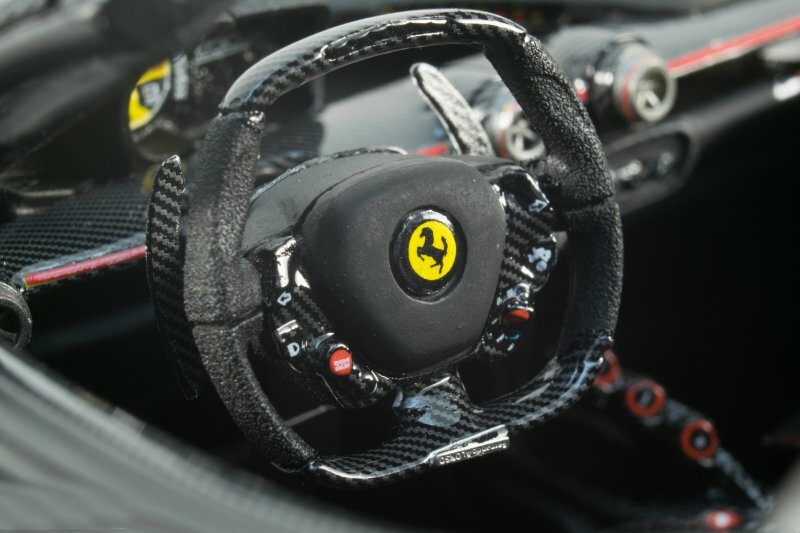 Over in the passenger area of the cockpit there isn’t much to see, except the LaFerrari Aperta sticker below the small glovebox. I can’t help but think that MR Collection could have done this in a proper photo-etched badge? 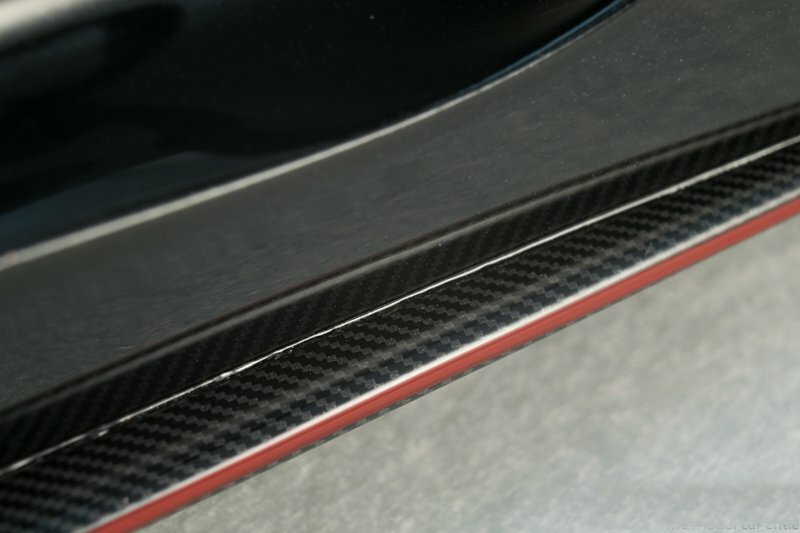 The door cards show off a lovely Alcantara and carbon fibre sandwich. 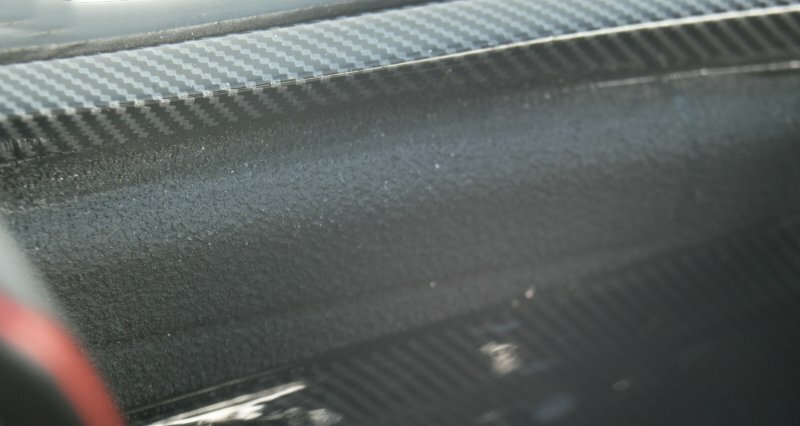 The wall behind the seats is covered in carbon fibre and features a 70th Anniversary plaque dead centre. It is really really small, yet MR Collection did a good job here, if not for the overall shape being slightly off compared to the real car. Not something you’d notice anyway. Now we come to the piece de resistance of this model and a set of seats worthy of the model world equivalent of an Oscar. This is where MR Collection have truly outdone BBR based on pictures I’ve seen of their version. 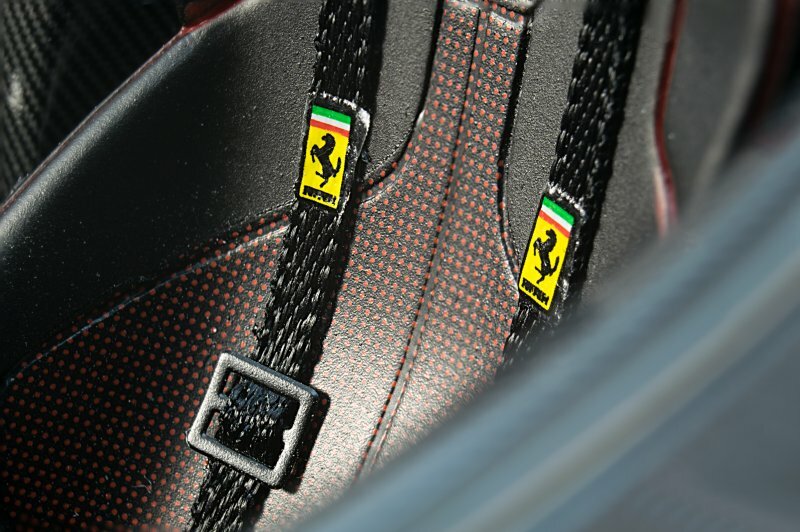 The Prancing Horse logo sits proudly on the headrest in red that matches the colour of the piping as well. 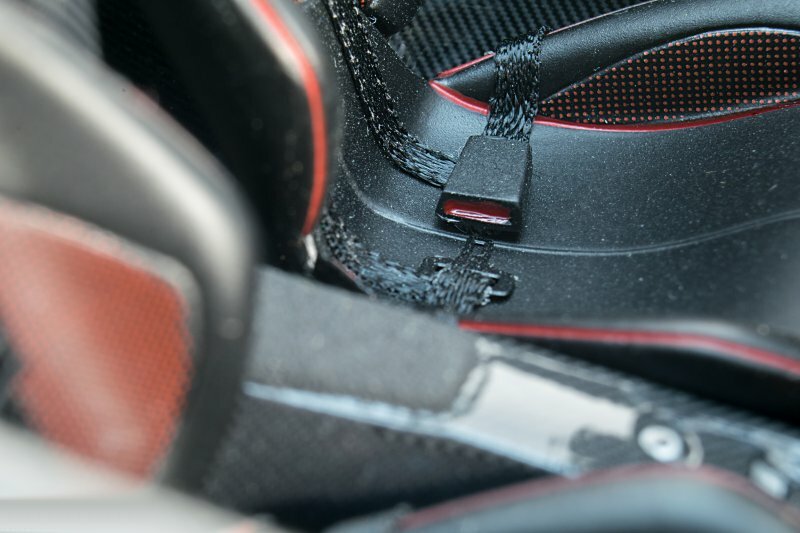 There is a small amount of paint overrun when looking up close, but when you drop your gaze to the lower part of the bucket seats you can see the real cloth seatbelts with adjusters and the Prancing Horse on each one. 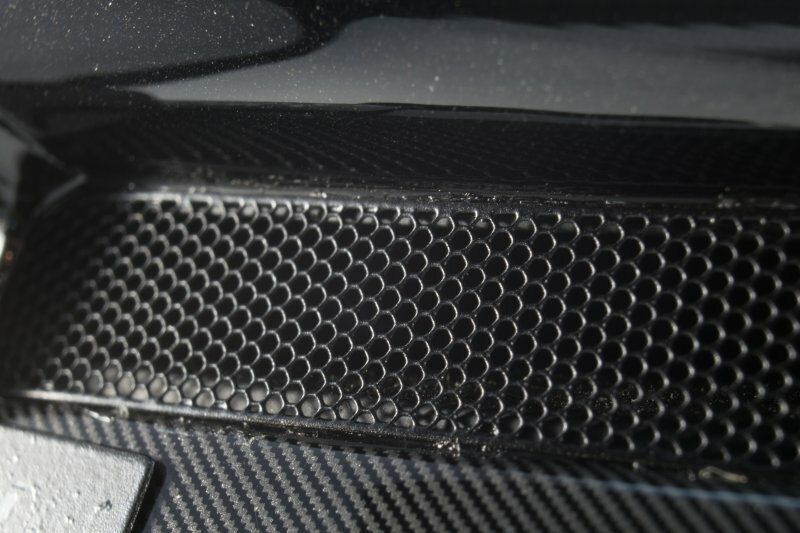 You can also see the perforated effect they were going for. 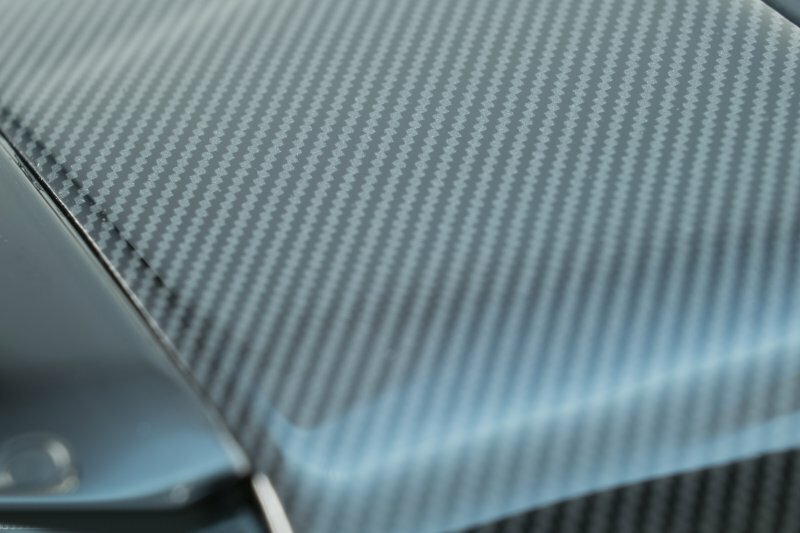 Whilst maybe not providing the “perforated texture” MR Collection have explicitly claimed, there is no denying how great the effect makes the seats look! Dropping further down you can see more of the perforated design as well as the tongue resting on the seat next to the buckle. 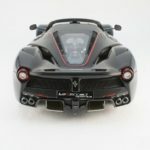 So what is my overall opinion on the MR Collection Ferrari LaFerrari Aperta in 1:18 scale and finished in the Nero Daytona with Rosso Corsa livery that was presented at the 2016 Paris Motor Show? Well, if you’re in the market for one of these models, I think we can generally assume you’re not short of a quid or two, so I’m not going to discuss whether I think this is worth the 400 or so Euros this retails for. 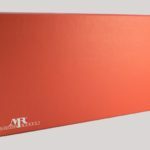 At this end of the market, the price is largely irrelevant, although I know of a few collectors who save up for a while to buy a high end model like this – I hope this review has served its purpose in informing you as best as possible whether this is the right model for you to spend your hard earned money on! 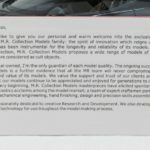 So did MR Collection deliver on their promise of new improvements? 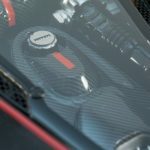 On the whole, I think they definitely did and have certainly moved the game on with details such as the Alcantara effect dashboard and door cards and seat belts. 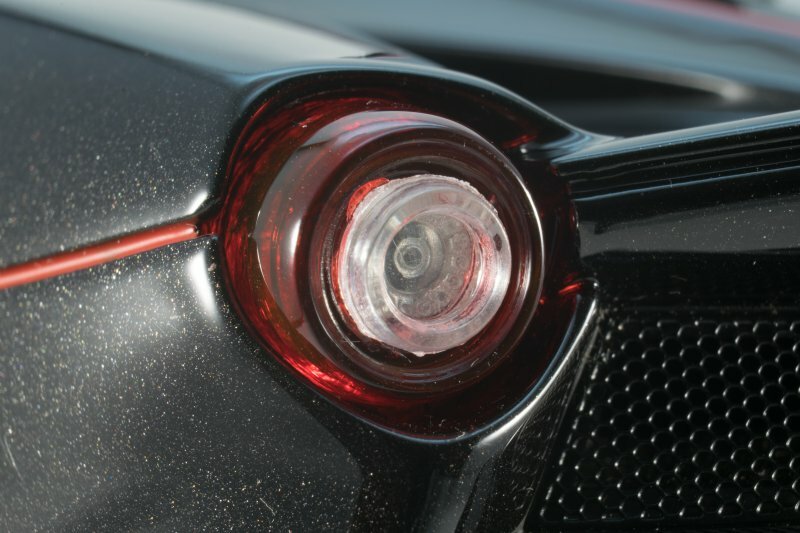 I’m not entirely convinced of the soft-touch paint they mentioned if I’m honest, but maybe that’s just me missing something so feel free to enlighten me on this point. 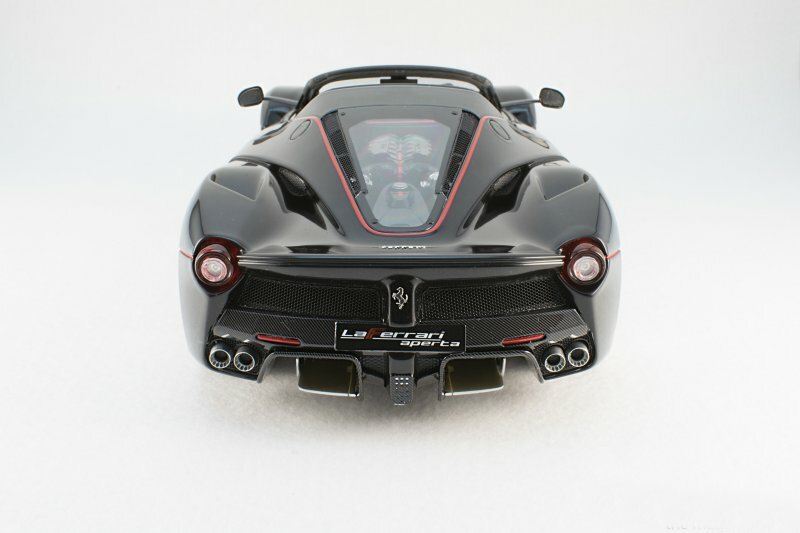 I think the main comparison to be made here is between MR Collection’s version and BBR’s version of the Aperta. Whilst I have only seen pictures and a short video review of BBR’s version I think MR Collection certainly wins on engine detail and on the various parts of the interior as mentioned above. On the other hand, I think BBR has got the finish of the wheels, exhausts, the 70th Anniversary badges on the sides nailed plus the inclusion of the rear parking sensors. In short, I don’t think there is one absolute perfect version out there… it is now down to you to decide which one is more perfect in your eyes and worthy of display in your collection! 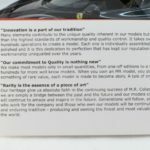 1 Response to "REVIEW: MR Collection 1:18 Ferrari LaFerrari Aperta"